Trixie Tarbes Doggy Rain Jacket is a beautiful and transparent rain jacket that ensures that your dog stays dry, even when it rains. This jacket is easy to put on thanks to the handy Velcro fastener. What's more, this rain jacket has a fun, reflective paw print on the back. This makes your dog highly visible in the dark. 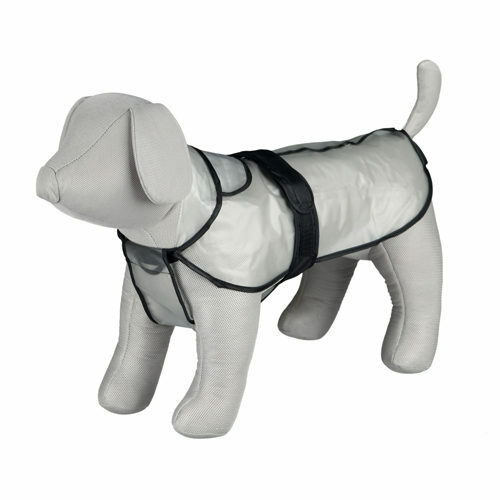 Trixie Tarbes Doggy Rain Jacket is a beautiful doggy rain jacket made from transparent pvc material. You can easily put this rain jacket on your dog thanks to the handy Velcro fastener. Thanks to the reflective paw print on the back, your dog is highly visible in the dark. In order to make sure that you are ordering the right size for your dog, it is important that you measure your dog properly. In the article How do I know what size my pet needs?, we give you tips on how best to measure your dog. Which Trixie Tarbes Doggy Rain Jacket is right for my dog? What if the Trixie Tarbes Doggy Rain Jacket doesn't fit? The Trixie Tarbes Doggy Rain Jacket can be removed from the packaging and held up next to your dog in order to check whether it fits. For hygiene reasons, the jacket cannot be returned if it has come into contact with your dog. If we find that the returned jacket is stained, worn, contains hair, smells or has been washed after use, we cannot return the product to you. In this event, it will be donated to a charity (local shelter). As we are often confronted with products that are returned in a less than new condition, we have to apply these rules for fitting and/or returning products. Have you used Trixie Tarbes Doggy Rain Jacket before? Let us know what you think about this product.